Petty considerations over rank and military etiquette and wounds cost the Confederacy, for lengthy periods, the services of one of its most effective, top commanders, Joseph E. Johnston. The Virginia native and West Pointer (1829), rated by many as more capable than Lee, was the highest-ranking regular army officer to resign and join the Confederacy. With the staff rank of brigadier general, he had been the national army's quartermaster general for almost a year when he quit on April 22, 1861. His earlier career had included eight years in the artillery before he was transferred to the topographical engineers in 1838, when he rejoined the army a year after his resignation. During the Mexican War he won two brevets and was wounded at both Cerro Gordo and Chapultepec. He had also been brevetted for earlier service against the Seminoles in Florida. Having been appointed quartermaster general on June 28, 1860, he remained in the service until after the secession of his native state. His Virginia and Confederate assignments included: major general, Virginia Volunteers (April 1861); brigadier general, CSA (May 14, 1861); commanding Army of the Shenandoah June 30 - July 20, 1861); commanding Army of the Potomac July 20 - October 22,1861); general, CSA (August 31, 1861, to rank from July 21); commanding Department of Northern Virginia (October 22, 1861 - May 31, 1862); commanding Department of the West (December 4, 1862 - December 1863); commanding Army of Tennessee (December 27, 1863 - July 18, 1864); commanding Army of Tennessee and Department of Tennessee and Georgia (February 25 - April 26, 1865); also commanding Department of South Carolina, Georgia and Florida (February 25 - April 26, 1865); and also commanding Department of North Carolina (March 16 - April 26, 1865). Initially commissioned in the Virginia forces, he relieved Thomas J. (later "Stonewall")Jackson in command at Harpers Ferry and continued the organization of the Army of the Shenandoah. When the Virginia forces were absorbed into the Confederate army he was reduced to a brigadier generalship. When the Union army under Irvin McDowell moved out of Washington and Alexandria to attack Pierre G.T. Beauregard at Manassas, Johnston managed to totally fool Pennsylvania General Robert Patterson with a small force in the Shenandoah Valley and move the bulk of his forces to Beauregard's support. During the battle of lst Bull Run, Johnston, although senior to Beauregard, left the general direction of the battle to the junior officer due to a lack of familiarity with the terrain. Johnston was basically engaged in forwarding freshly arrived Valley troops to the threatened sectors. The two generals shared the glory and were critical of supply problems which they felt prevented a march on Washington. The next month Johnston became one of five men advanced to the grade of full general-all Confederate generals wore the same insignia of rank, three stars in a wreath-but was not pleased with the relative ranking of the five. He felt that since he was the senior officer to leave the "Old" service and join the Confederacy he should not be ranked behind Samuel Cooper, Albert Sidney Johnston, and Robert E. Lee. Only Beauregard was placed behind Johnston on the list. This led to much bad blood between Johnston and Jefferson Davis. There would be more. With his increased rank, Johnston was given command of the Department of Northern Virginia and became engaged in what was virtually a phony war with the Washington-based army of George B. McClellan. Throughout the winter of 1861-62 he maintained his position at Manassas junction and then withdrew just as McClellan's superior force advanced. In the meantime he had engaged in a dispute with his president over a policy of brigading troops from the same state together. Johnston argued that a reorganization could not with propriety be carried out in the face of an active enemy. When he withdrew his army from the line of Bull Run he reinforced John B. Magruder on the Peninsula east of Richmond and took command there. With McClellan again facing him, he held Yorktown for a month before pulling back just before his opponent again advanced. His forces fought a rearguard action at Williamsburg and were then encamped on the very outskirts of the new nation's capital. In an effort to drive McClellan off, Johnston launched an attack south of the Chickahominy River at the end of May 1862. The battle of Seven Pines, or Fair Oaks, turned out to be a confusion of errors in the confusing terrain. For years afterwards there was acrimonious debate among various Confederate generals over who was to blame for the limited success. On the first day of the battle Johnston re-exhibited his tendency to attract enemy bullets and was succeeded the next day by Robert E. Lee who was to lead the Army of Northern Virginia for the balance of the war. Upon his recovery he was given charge of a largely supervisory command entitled the Department of the West. He was in charge of Braxton Bragg's Army of Tennessee and John C. Pemberton's Department of Mississippi and East Louisiana. With few troops under his immediate command he proved powerless in attempting to relieve the besieged garrison of Vicksburg under Pemberton. 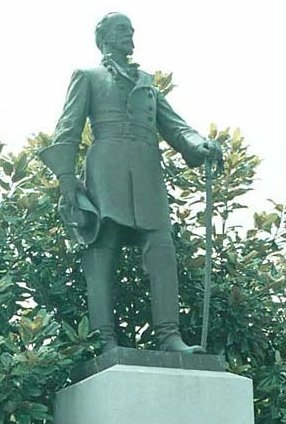 Following the river city's fall, he made a feeble attempt to hold Jackson, Mississippi, against the advance of William T. Sherman. Following Bragg's disastrous defeat at Chattanooga, Johnston was given immediate command of his army and the next spring and summer directed a masterful delaying campaign against Sherman during his advance on Atlanta. However, his continued withdrawals raised the ire of Jefferson Davis, and he was relieved in front of the city. His successor, John B. 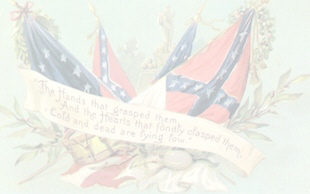 Hood, then began his destruction of the Army of Tennessee with reckless tactics. With Sherman having marched clear through Georgia and begun his drive through the Carolinas, a clamor arose in the Confederate Congress for Johnston's resumption of command. Davis finally relented in early 1865 and the general took eventual command of three departments. 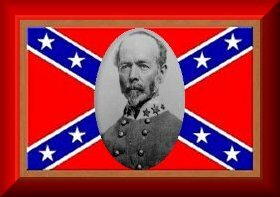 Unfortunately for the Confederacy his forces were heavy on generals but weak on men. He could do little but hope for a linkup with Lee's army so that they could turn on either Grant or Sherman and then on the other. It never came off and he surrendered his forces following some difficulties over terms, bordering on the political, on April 26, 1865, at the Bennett House near Durham Station, North Carolina. He had been one of the most effective Confederate commanders when he was not hampered by directives from the president. Did you know that the only statue ever erected in his honor is located right here in Dalton, GA. The statue was erected in October 1912 by the United Daughters of the Confederacy at the cost of $6000 dollars. It is 15' high, made out of bronze, sitting on a base of Georgia marble. He is portrayed holding his hat in his right hand and his sword, pointed down, in his left. It is located at the corner of Hamilton and Crawford Street.